This factsheet presents research findings from a BPEX-funded PhD project carried out at Newcastle University and is published as number 25 in the 'Research into Action' series. The project investigated the ability to estimate the phosphorus (P) requirements of growing and finishing pigs and to predict the consequences of different management strategies on phosphorus excretion to the environment and on efficiency of use. Phosphorus is an important mineral for both the metabolism and skeletal development of the growing pig. In pig diets, phosphorus is the third most expensive nutrient required after carbohydrates (energy) and protein. BPEX KT Bulletin 23 provides background to this work. The low digestibility of phosphorus in plant materials used in pig feed means that supplementary inorganic phosphorus has to be included; this is non-renewable and expensive. The undigested phosphorus is excreted in manures, which, if washed into waterways, can cause pollution (eutrophication). To investigate the consequences on phosphorus excretion of two management strategies: phase feeding and sorting. 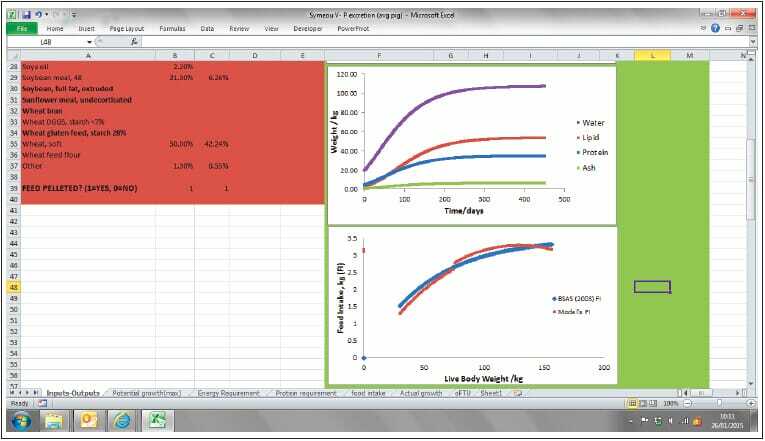 The decision support tool is able to estimate the requirements for digestible phosphorus for different stages of pig growth and different genotypes. The tool is capable of predicting the phosphorus requirements of new genotypes without the need to erform experiments. This is an improvement over the previous British Society of Animal Science (BSAS) guidelines for estimating phosphorus requirements for pigs. Initially the tool was developed for the ‘average’ pig in a group, taking into account the supplementation of the diet with added phytase enzymes which can improve digestibility of plant phosphorus. The predictions of the tool were compared with the outcomes of actual experiments reported in the scientific literature. 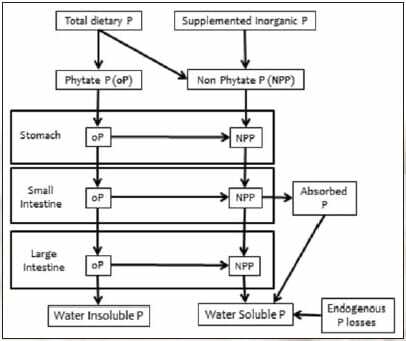 However, the tool over-estimated phosphorus digestion and hence underestimated phosphorus excreted from diets based on rapeseed meal and co-products, such as Distillers Dried Grains with Solubles (DDGS), including diets supplemented with microbial phytase. Also, the tool overestimated phosphorus retained on diets high or relatively high, in calcium (Ca) and consequently underestimated phosphorus excreted, especially on diets supplemented with microbial phytase. Further modifications were made to take account of variation in phosphorus requirement among different pigs and the uncertainty in feed composition; the latter contributed more to performance variation than uncertainty regarding mixing efficiency or pig genetic characteristics. This emphasises the need to take into account the variation that exists within feed ingredients when considering phosphorus retention and excretion. Sorting involves feeding pigs according to their size, by separating the lightest pigs and feeding them a diet higher in phosphorus content than their heavier counterparts. Sorting pigs reduced phosphorus excretion to a much lesser extent. The reduction was greater as the percentage of pigs allocated to the light group increased from 10 to 30 per cent (1.5 per cent and 3.0 per cent reduction in phosphorus excretion, respectively). This resulted from an increase in the phosphorus excreted by the light group being compensated for by a greater decrease in the phosphorus excreted by the remaining pigs. Sorting pigs increased the percentage of light pigs that met their phosphorus requirements and only slightly decreased the ercentage of remaining pigs that met these requirements at any point of their growth. The opposite was seen for the pigs that were supplied less than 85 per cent of their phosphorus requirements. the application of the tool to predict the consequences of different management strategies on phosphorus excretion. There are plans to develop the tool further to account for these inconsistencies in order to make it more relevant as the pig industry moves towards greater use of co-products. Plans to extend the tool and increase its applicability are in place; this will be done in association with the British feed manufacturing industry. One recommendation is that the feed industry should provide a clear indication of the phytase activity in terms of FTU. One phytase unit is the activity of phytase that generates 1 micromole of inorganic phosphorus per minute from 0.0051mol per litre of sodium phytate at pH5.5 and 37°C. There could be enormous value in this and other work if nutrition and breeding companies could share information and collaborate to provide relevant data regarding standard growth rates and feed intake. 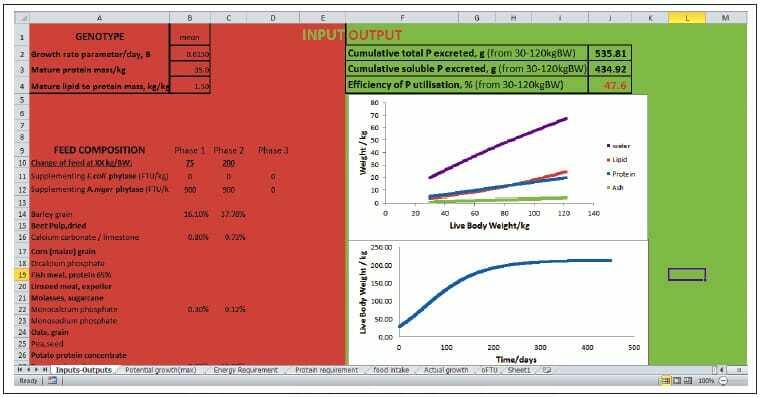 The model showed that leaner genotypes excrete less phosphorus but gross efficiency of phosphorus utilisation is lower when both lean and fatter genotypes are given access to the same food; this is because they need to eat less feed to put on a kilogram of weight. Some ingredients have a more positive consequence in terms of phosphorus excretion than others and the model allows one to assess this. The work has shown that with regard to feeding strategies phase feeding follows the law of diminishing returns, i.e. fewer benefits are expected in terms of phosphorus excretion if the number of phases are increased from two to three. Sorting by weight as a feeding strategy does not produce returns from an environmental perspective compared to other feeding strategies but can produce returns from a pig growth point of view. The model suggests that variability in feedcomposition, due to variability in the nutrient content of the ingredients used or due to mixing inefficiency, will have substantial effects on phosphorus excreted from groups of pigs. The model considers different growth characteristics based on genotype; the user must select a genotype parameter applicable to the pigs for which they intend to use the model outputs. Users therefore, need a good understanding of the characteristics of different genotypes.